Need More Information, Get in Touch Today! Looking for something to do at Easter? 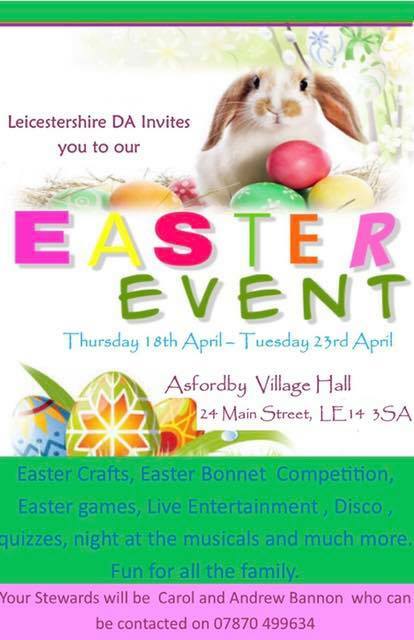 Why not join Leicestershire DA at Asfordby Village Hall, LE14 3SA. The site will be open from Thursday 18th April to Tuesday 23rd April. There will loads of Easter themed crafts, fun activities and competitions for the whole family. Live entertainment on Saturday evening, discos, a night at the musicals and much much more. £10 per unit per night. 14th -16th June Fishing Weekend Fortway Farm. 28th-30th June Activity Weekend LOPC. 23rd May 30th May THS:-Stratford upon Avon Racecourse. 30th July to 28th August 2019 THS:-Skegness Academy. We will have a full program of events. Leicestershire District Association of the Camping & Caravanning Club. This is the web site for Leicestershire DA, with lots of useful information about Leicestershire D.A.